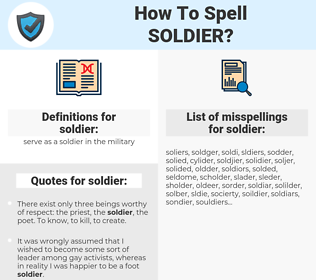 What are the misspellings for soldier? What are the common mistypes for soldier? What is the definition of soldier? What are the quotes for soldier? What are the translations for soldier? 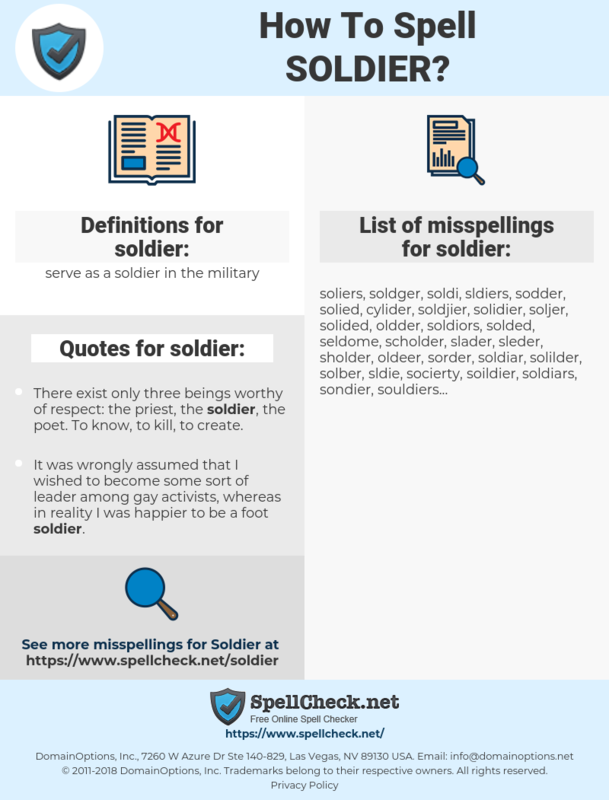 What are the common typos for soldier? This graph shows how "soldier" have occurred between 1800 and 2008 in a corpus of English books. The front -line soldier wants it to be got over by the physical process of his destroying enough Germans to end it. He is truly at war. The rest of us, no matter how hard we work, are not. 兵士, 兵隊, 軍人, ソルジャー, ぐんじん, 兵家, 強者, へいたい, つわ者, 武弁, つわもの, ぐんそつ, ぶべん, 軍卒.